Don't leave Fido or Fluffy at home - pack the whole clan for a new twist on traveling. We've got tips, products, destinations and more on traveling with your pet. PET GEAR: TRAVEL MADE EASY! . What's new in pet gear for the family on the go. PET GEAR: CAR Accessories . Deck out the vehicle for easy travel with Bowser. 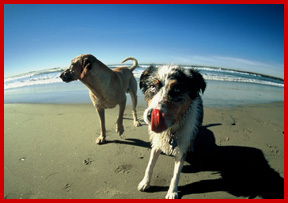 VET TIPS: Ideas on traveling with your pet, his needs, your needs and more. Insiders guide to make your life easier. TAHOE DOGS! Take the dog to Tahoe . Lodging, play parks and more. CHAIN HOTELS that welcome pets. Overview and more. SPA DOGS! Pampered pooches love the TELLURIDE SPA .